This longer article was originally intended for presentation at the event to mark 200 years since the birth of Karl Marx. Due to time constraints, the shortened version featured below was delivered and was well received. In paying our respects to Karl Marx, we should also acknowledge the important role of Frederick Engels, his comrade, collaborator and faithful supporter, in their development of the ideological position known as Marxism. For Marx and Engels, change was not simply gradual evolution, but took place suddenly as a result of unresolved and intensifying internal contradictions. This led to a new and higher level of development which contained its own new internal contradictions. Their concept of dialectical materialism saw the development of things as an upwardly spiral process that applied to nature, to science and to human thought and revolutionary changes in human society. Dialectics recognises that internal contradictions are inherent in all things and natural phenomena. They all have their negative and positive sides, a past and a future, something dying away and something developing; and that the struggle between these opposites, the struggle between the old and the new, between that which is dying away and that which is being born, between that which is disappearing and that which is developing, constitutes the internal content of the process of development, the internal content of the transformation of quantitative changes into qualitative changes. In their studies of history and societies, Marx and Engels determined that the source of the ruling ideas and power structures at each stage of history and within each society was the economic mode of material production and the corresponding economic relationship between the classes that arose as the mode of production developed. The division into classes arose when humankind was able to pass from the hunter-gatherer stage into primitive agriculture and animal husbandry – this meant a surplus became available and led to the growth of population and trade – it also meant the division of labour, a division of skills, and a certain level of organisation from which the division into classes arose and subsequently the emergence of a state apparatus constructed to serve the class that ruled. Those with the key practical and organisational skills became the ruling class, appropriating much of the surplus production and constructing laws and practices that perpetuated their rule and the dominance of their ideas, while using state power and force to suppress rebellion and contrary ideas. Social development and change is driven by the development of the productive forces and the never-ending struggle between competing classes. This is the common thread running through all societies from slave-owning, to feudal, to capitalist, and all their combinations and variations. 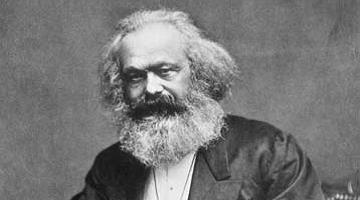 Karl Marx is best known for his monumental work Capital, published in 1867, which examined the operation of capitalism and capitalist society in exhaustive detail. In capitalist society, the ruling class of capitalists owns the means of production, the factories, workplaces and largest land-holdings. At the other end of the scale are working people with no means of material production, who need to sell their labour power in the market-place to have a job, in order to survive and maintain their existence. Marx called this class of working people proletarians, and showed that their exploitation was the source of capitalist profits. The value of a worker’s labour power is equal to the value of all those commodities which the average worker must consume to maintain themselves and their family, to ensure ongoing and future labour power for the capitalist class. This value is paid for by the capitalist in the form of wages. But unlike other commodities and materials consumed in the process of production, labour power has the unique characteristic of adding value in the process of its consumption. After several hours work, under average conditions, the worker may be close to adding sufficient value to the production process to repay the capitalist for the wages received. But workers cannot just knock off and go home when this point is reached. Generally they are hired for a set number of hours. (It used to be 8!) They are expected to keep on working and adding value to the production process until the allotted hours are up. The finished product is appropriated by the capitalist and sent to market. When it is eventually sold, its exchange value (price) reflects the cost of raw materials and their processing, plus the labour power added and paid for by the capitalist as wages, plus the additional labour power (Marx called it surplus labour) that is unpaid. It is this surplus labour and the surplus value that it produces that is the real source of capitalist profit – the hidden exploitation of workers who spend a portion of their working day performing unpaid labour. There is no such thing as a fair day’s pay under capitalsim! Higher paid workers with higher skills create higher levels of surplus value and suffer higher levels of exploitation! The capitalist mode of production gives rise to a constant struggle between the interests of the capitalist class who want to maximise their profits by: cutting wages, extending the length of the working day, replacing workers with new technology, speeding up the pace of work to increase the unpaid period of labour; and the working class who struggle to resist and roll back the new level of exploitation. Trade unions can unite and organise the workers to be more effective in the struggle against capitalist exploitation and can win some temporary reforms and concessions, but do not fundamentally challenge the continuing rule of the exploiters. It is only when the class struggle becomes political that the revolutionary overthrow of the entire ruling capitalist class comes on the agenda. Marx defined the main contradiction within capitalism as that between private monopoly ownership of the means of production and the socialised nature of labour. This contradiction becomes critical during periods of overproduction, leading to mass unemployment and poverty, and often war. For society to advance, eventually the contradiction must be resolved by revolutionary change to replace private ownership of the means of production and control with socialised ownership and control – socialism. The revolutionary smashing of the old state power by the working class is only the beginning of the much greater, more complex and difficult task of building a new class-less communist society. Marx recognised that it was not possible to establish class-less communist society in one hit, and that a fairly long transition period would be necessary to create not only the material conditions, but also to develop the social outlook necessary. Marx and Engels saw the necessity to establish planned and regulated production to overcome the random anarchy of capitalist production, and to produce goods and services to meet the real needs of the people rather than just for profit. This controlled economic development would also avoid the boom-bust cycles characteristic of capitalism. This first stage of communism, the stage of transition, is Socialism. Dictatorship of the proletariat is simply class rule by the working class. It replaces the dictatorship of the bourgeoisie, i.e., the capitalists as a class. Unlike the rule of the rich, who seek only to perpetuate their rule, the working class state acts in the interests of the majority of the people, and works to empower the working people in such a way that it will eventually “wither away”. Communist society would then operate on the principle, “From each according to his ability, to each according to his needs,” meaning that all would be able to contribute to society at their highest ability, and in turn receive the needed goods and services of society; food, housing, healthcare, education, etc. Humanity would move from the realm of Necessity to the realm of Freedom, able to enjoy socially useful and sustainable work, and pursue social and cultural activities, all in harmony with nature. Marx and Engels were not content just to analyse the world as it was, they sought to change it for the better and took the side of the working class. They initiated discussion circles and practical revolutionary political activity through the Communist League (1847) and the International Working Men’s Association (1864). They followed closely the struggles of working people and the great revolutionary upheavals in Europe, and even observed the Eureka rebellion (1854) in far-away Australia. For the international capitalist class in this era of rampant imperialism Marx is still relevant – the idea of working people exercising ownership and control of society threatens their very existence, and legions of academic experts have been trotted out over the decades to refute, distort and vilify him. Nevertheless, he refuses to lie peacefully in the grave and the spectre that is socialism continues to haunt them. But more importantly, Marx continues to have great relevance for the international working class because many of his insights and predictions have been shown to be valid, even though capitalism has proven to be more resilient and complex than Marx may have imagined. Was he not correct about monopolisation? “One capitalist kills many” he wrote. Mergers, takeovers, share-raids gobble up the small and vulnerable. They leave the so-called free market dominated by global conglomerates which sometimes compete and often collude to exploit working people and dictate to governments. Was he not correct about the global capitalist economy? Corporate monopoly capitalism has spread across the world, exploiting not only the working people in the developed countries, but dragging millions of workers in poor and under-developed countries into subsistence wage-slavery. Was he not correct about the concentration of wealth in the hands of a few? Recall the Oxfam Report on global inequality which showed that the richest 1% rake in 82% of the wealth produced. Was he not correct about automation and the prediction that many workers would be replaced by machines? Now we have robot factories, driverless trains and computerised warehouses and container depots. And let’s not forget drone warfare and the militarisation of space. Was he not correct about the degradation of the natural environment caused by capitalism’s hunger for more commodities and more markets? There is a growing crisis of climate change due to carbon emissions from the corporate monopolies’ fossil fuels, and also pollution of the oceans, deforestation, soil degradation and the continuing loss of biodiversity. Was he not correct about the alienation of workers from their labour? Insecure work, casual work, short-term contracts, agency work, irregular hours, fly-in fly-out, no prospects of improvement – for many there is no longer any “job satisfaction”. Alienation from other workers also, not only in the competition for work, but in the breakdown of communities and the scattering of workers. Was he not correct about commodity fetishism? The latest mobile phone, the four-wheel drive SUV, the large screen TV, all marketed as desirable, almost as necessities, and easily financed by credit card debt. Was he not correct about the apparatus of state power and the superstructure of society operating in the service of the capitalist class? In this era of monopoly capitalism and imperialism, subservient governments and politicians grovel before the giant corporations and the Rineharts and Murdochs, subsidise their ventures and let them off tax-free. Free Trade Agreements document the exceptions to free trade – if there really was free trade, there would be no need for any written agreement. Was he not correct in arguing that the only alternative to private ownership of the means of production and distribution was collective, socialised ownership, where the wealth of society was in the hands of the working class majority and used to benefit all? Some say that capitalism can be reformed, made “nicer” by the demands of civil society. Communists reject this. The world today is in a mess. Life on Earth is threatened more than ever by the prospect of nuclear war and the crisis of climate change. There are now continuous wars in many parts of the world, provoked and maintained in a large part by US imperialism and the weapons industries. There is increasing violence and repression against working people, indigenous communities, and peasant farmers as struggles break out against poverty, exploitation and the plunder of land. People across the world are searching for answers and alternatives to imperialist wars, famine, unemployment and insecure work, many social and economic problems, exploitation of workers, destruction of the environment and accelerating climate change, and fascist oppression. Socialism as an alternative is once again on the agenda. In the Philippines and India the revolutionary struggle is intense, and there are growing movements in the developed capitalist and imperialist countries. The revolutionary principles Marx and Engels determined are universal; and their application takes account of the particularity and character of different material and historical conditions in different countries and historical epochs. In Australia monopoly capitalism is dominated by US imperialism economically, politically, militarily and culturally. It is our view that Australia’s socialist revolution will, by necessity, pass through an anti-imperialist independence struggle that will unite the overwhelming majority of the people and be led by the working class along the road to socialism. Embedded in the CPA (M-L) program of revolution by stages there is no intermediate stage between capitalism and socialism. The current stage in the struggle to end capitalism and advance socialism in Australia is a revolutionary struggle for anti-imperialist independence. Through this struggle the foundations for socialism, and the eventual move towards communism are laid. We do uphold and promote the struggle for socialism. Long live the work of Karl Marx!